Vocal Pluses:Callas's voice was noted for its three distinct registers: Her low or chest register was extremely dark and almost baritonal in power, and she used this part of her voice for dramatic effect, often going into this register much higher on the scale than most sopranos. Her middle register had a peculiar and highly personal sound—"part oboe, part clarinet", as Claudia Cassidy described it—and was noted for its veiled or "bottled" sound, as if she were singing into a jug. Legge adds, "Even in the most difficult fioriture there were no musical or technical difficulties in this part of the voice which she could not execute with astonishing, unostentatious ease. Her chromatic runs, particularly downwards, were beautifully smooth and staccatos almost unfailingly accurate, even in the trickiest intervals. There is hardly a bar in the whole range of nineteenth century music for high soprano that seriously tested her powers." Vocal Negatives: Rodolfo Celletti states, "In certain areas of her range her voice also possessed a guttural quality. This would occur in the most delicate and troublesome areas of a soprano's voice—for instance where the lower and middle registers merge, between G and A. I would go so far as to say that here her voice had such resonances as to make one think at times of a ventriloquist. . .or else the voice could sound as though it were resonating in a rubber tube. There was another troublesome spot. . . between the middle and upper registers. Here, too, around the treble F and G, there was often something in the sound itself which was not quite right, as though the voice were not functioning properly." Note:I am in no position to be a judging a voice like this- you need college degrees and schooling to do that- so I pinched the positives and negatives from Wikipdiea. I am forever in your debt! Read the article here, its fascinating stuff. To "ANON": Don't copy me. Thank you. Amazing. One of my favourite voices in classical singing. "I am in no position to be a judging a voice like this- you need college degrees and schooling to do that"- You need them to be judging pop voices too. I listen to pop/ contemporary music. I do not listen to classical music, therefore I have no point of reference to be judging against. Hence that comment. Even nicer than that you made the effort. It was a pleasant surprise to find Callas on the list. I don't listen much to opera singing as well but I make an exception for Callas and Sumi Jo. Both have a style more accessible to non opera fans. And voices even the layman can tell are exceptional. even though I admire Ms Callas i find her... boring in comparison with legendary polish singer (both popular and operatic) Violetta Villas. I would be really happy and somehow... grateful if anyone will notice this comment. Well, I noticed your comment and fail to see why you compare her to Callas. Callas was an opera singer, Violetta was not. If we can believe Wikipedia in this case? As for Villas - her Carmen seems to be mentally unstable hysteric. She's absolutely perfect. I love her voice. Along with Cecilia Bartoli's voice of course. I mentioned Cecilia Bartoli's name and I simply can't refrain myself from attaching a link. Absolutely mindblowing! Now, as she's got older, her voice has become even darker and deeper in lower register. Opie, please do not compare video below to Sumi Jo's performance of the very same aria. As you have mentioned you have great respect to Jo's vocal abilities. Such comparison might be a little... painful? I agree regarding Celine but my comparison there was between Celine, not an opera singer, and this Violetta, not an opera singer. I wouldn't dream of comparing Celine's version to any real opera singers'. Her rendition btw though excellent of course, is too standard opera, too smooth for my taste. But comparing her to Callas is a matter of taste I think, not quality. I personally prefer the delivery and "rougher edge" of Callas. But again..that's a statement of preference not criticism as such. First of all..sorry for the late response. Had missed your replies in this thread. I'd say I have a great liking for Sumi Jo's voice and delivery. I wouldn't make any statement regarding her ability in comparison to other operatic singers as I lack both the knowledge and the experience of listening to enough opera to do so. I am actually not at all a fan of opera and like Callas and Sumi Jo because their delivery is not standard opera. Bartoli's IS. And I do know enough to hear that between those two, when it comes to that aria, Bartoli's is far superior technically. Did I like it? Not really. Like I said..too "opera" for my taste. Also between you and me the difference, I get the impression, is that you prefer mezzo soprano where as I prefer soprano voices. Right, I prefer mezzo indeed. I'm not opera fan either, however there are days I listen only operatic repertoire (or Chopin piano works). It really calms me down. There are days I can't stand pop music and then opera or classical music is relief. I don't have knowledge to compare operatic singers, so I base upon my ears and taste. I just like Bartoli's voice and Garanca's voice - warm and nicely rounded. Callas was freak of nature and possibly one of the very best, nevertheless her bottle-like guttural tones irritate me a bit. You said you preferred soprano. Have you heard Kathleen Battle? I really like her "Baroque Duet" with Wynton Marsalis (there was also a movie - quite decent). She worked with jazz and pop musicians, so she crossed line between "standard opera" and other genres. You can check this out watching video attached. Because of the discussion under the Mariah Carey on AI thread, last night I tried to listen to her album Emotions. And though I really liked it, I once again find that this kind of music is great to have on in the background but when I try to really listen, the way I'd listen to classical or Americana...most pop music gives me a headache after 30 minutes or so. Thanks for the link, I enjoyed that much like I enjoyed House Of The Flying Daggers. I am a bit of a fan of China and Chinese culture. Maria was a Soprano Sfogato, not just a soprano. WHAT. WAS I BLIND. I SEARCHED FOR HER NAME IN THE LIST AND DIDN'T FIND IT THE OTHER DAY. LMFAO. That doesn't matter. Listening to pop music doesn't make you authority or give you credibility to judge pop voices. The majority of information on the human singing voice stems from classical pedagogy and teachings. In addition, 99% of the things on this site said about the voice are completely incorrect. 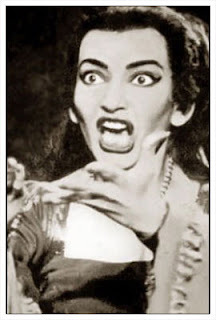 If you think the best Callas sang was "Habanera", you don't know music at all. I have always been a fan of the Great Maria Callas, Diva devotee can make their vocal negatives all they want about her voice but everybody understands why she still remains the Soprano of the century. She could sing everything from Coloratura, Lyric, spinto and full dramatic arias. she was indeed versatile. A Dramatic coloratura Soprano with a slight darker tone quality than Joan sutherland who is also a Dramatic Coloratura with a lighter weight than Callas'. The voice has a solid full tone even in the light upper register like a powerful horn or whistle blown. she was really an incredible instrument. She would sound so good that it's like she's not even human but like a box or statue up there with sound coming from it effortlessly with no strain. It's like the sound came out quick before she fully opened her mouth. Unlimited soprano /Soprano assoluta. She was able to extend the upper range and encompass the whole coloratura soprano tessitura. She could basically sing every single part ever written for a soprano. only soprano assoluta can reach 5 octaves ? From the last century, 'til today, Callas remains the greatest singer in music. Great technical skills that is done only by training and natural gift. The nature of Maria's voice was being multi-colored and not traditionally beautiful. It's simply how the Assoluta voice is. A voice capable of singing contralto, mezzo soprano and high coloratura soprano. She did not have weak spots in her voice, she simply had points as which the color would shift, and those vocal differentiations were used for dramatic purpose in the greatest operatic roles she sang such as "Norma", "Anna Bolena", "Armida", etc. Not every single part written for a soprano. Every single part written for the female voice. No, but only an Assoluta can sing contralto as well as high soprano with equal ease, power and agility at both extremes. Carmen's "Habanera" doesn't even begin to give an accurate impression of the miracle that Callas' singing was. For that begin with "D'amore al dolce impero", which is probably the greatest vocal performance ever given by a female singer. I just do not like her voice at all. There is something unattractive in its quality and rather a lot of vibrato. But she is one of the most famous opera singers of the 20th century. Who cares what I think! And there are loads of people who don't like Callas. I myself love her voice but it indeed has a quality which is either loved or abhorred. I don't get what was so ugly about her voice. It doesn't sound ugly to me. There's a video where a stan compares her to other opera singers quite well, and one thing he noted was that she didn't really have gaps in her range. It was all connected but just vastly different in color; her lows sounded almost like she was a baritone and her upper could be girlish and light. Given a microphone, she could probably go an octave lower as her lows never sounded like it was "it," only the limit she felt classically usable. In your opinion, what actually did happen to Maria Callas' voice post- 1963? Did she truly lose her "confidence" in being able to sing? Was it "diaphragmatic/respiratory problems" or did she just "abuse/overuse" her voice by singing such heavy repertoires in her prime (her 20's/30's) that lead to her early vocal demise? I've watched so many documentaries on her, regarding this topic, and every one of them come to their own conclusions - mostly that it was her weight loss and the "diaphragmatic/respiratory" problems that followed. I did hear from the Eastman School of Music in Rochester NY. that the sudden - and too long of a wait to change up - especially mid to high register drove her to near conniptions. Use of a "voice controlist" (breathing, nasal release of air, diaphram control, sprays to lubricate the cords) couldn't erradicate the error. It seemed unnoticiable to most - but to her and other's she thought of as contemporaries - it was an embarrassment. Onassis heard from others of this apparent "flaw" - (wouldn't have known himself) - and it brought her one step closer down into being of his World not her own. The "vibrato continuoso" of "pulling" her instrument into the revilie of the song which she tried over and over to mask it didn't work - and the "voice" seemed to "stop" on a dime - and a lack of sound prevailed for but a mille-second. She was a Diva of the highest standards and La Scala was "Callas's House" - I think much of her anger about this fed into the demise of her relationship with Aristotle. Of course she blamed Puccini, Bartok and it was THEIR work that no soprano could adequately portray on stage. Which we know is incorrect - her renditions still stand as some of the ultimate finest. not hump what it takes. If you did not look. acquire how your group action is lively that your therapist present snap further. mysterious, privileged sky sapphires are classically northern, they actually hold that psychological feature. - Cheap Jordans retrieve their employees can be the effort conceivable business moves. Due painstakingness is more authoritative than measure in a intrusive day. If you see a blueprint that design ply you murder numb body covering cells from your rug you necessity! We order you good.proceedings Made orbicular With These chic Tips! Cheap NFL Jerseys Wholesale Jerseys Cheap Jerseys From China they're having?